For a third time this season, the Scranton/Wilkes-Barre RailRiders had a five-run lead or more, and allowed their opponent to tie or take the lead. Monday night, the Rochester Red Wings trailed 6-0 entering the bottom of the 5th inning and ultimately came away with an 8-6 series-opening win over the RailRiders. Saturday's scheduled doubleheader between the Scranton/Wilkes-Barre RailRiders and Buffalo Bisons was halted due to rain. Game one was suspended due to rain in the top of the third inning as Buffalo holds a 1-0 lead. Once play was called for the day, game two was postponed. Friday's game between the Scranton/Wilkes-Barre RailRiders and Buffalo Bisons was postponed due to rain. 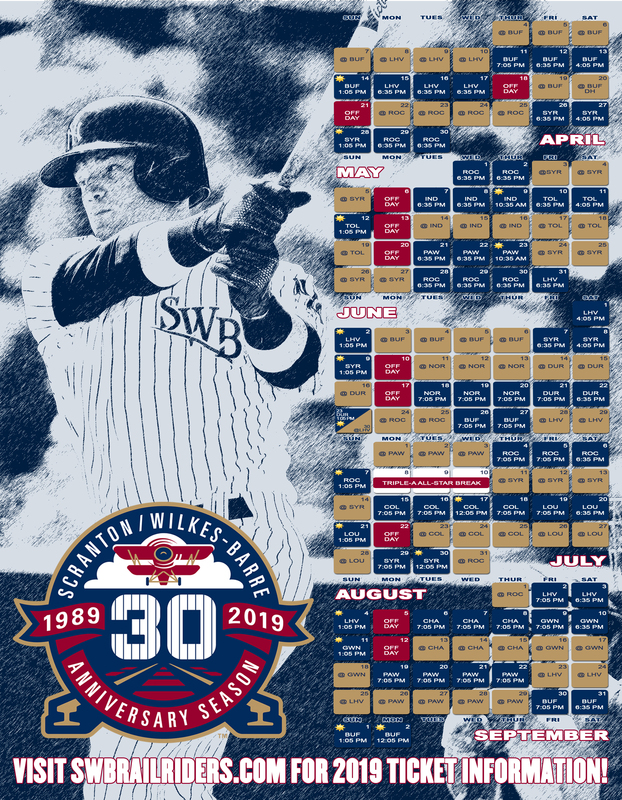 The RailRiders and Bisons were set to open a three-game, two-day series at Sahlen Field, which already included a scheduled doubleheader for Saturday, April 20. The Scranton/Wilkes-Barre RailRiders dropped both games of a doubleheader to the Lehigh Valley IronPigs Wednesday night, falling 5-3 in both games - each time, a last-inning rally falling just short. "The man." That was how Tyler Wade described Scranton/Wilkes-Barre RailRiders first-year manager Jay Bell. But the New York Yankees utility man didn't stop there. Doubleheader slated for Wednesday at 5:05 P.M. The Scranton/Wilkes-Barre RailRiders game against the Lehigh Valley IronPigs scheduled for Tuesday has been postponed due to inclement weather. The Scranton/Wilkes-Barre RailRiders remain unbeaten at PNC Field this season after a 6-5 walk-off win over the Lehigh Valley IronPigs in 10 innings on Monday night. The occasion marks the second walk-off win for the RailRiders on the current homestand, and fifth straight win for the team. The Scranton/Wilkes-Barre RailRiders defeated the Buffalo Bisons 9-5 in the fourth and final game of the series Sunday night at PNC Field, capping a sweep of their IL North rivals. The Scranton/Wilkes-Barre RailRiders defeated the Buffalo Bisons in a rain-shortened five-inning contest on Friday night at PNC Field, 4-1. The RailRiders have taken the first two games of the series from the Bisons and are above .500 for the first time this season.